We are rebuilding to serve you better. Trying to lose weight, transition to a vegetarian, vegan, and/or whole food diet? 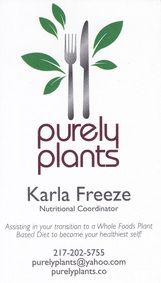 Call Karla Freeze (217) 202-5755, Nutritional Coordinator at Purely Plants. Read her great, inspiring story of personal health and transformation.